We are Paul and Viv Glatzel and we founded Powerboat Training UK back in 2000. When we founded the school our aim was to grow a centre that coupled an honest and straightforward approach to dealing with our customers coupled to a highly professional approach to training using first rate facilities and equipment. The school has grown and evolved far faster than we could have ever hoped and we would like to think that we are now considered amongst the premier providers of RYA Powerboat, Personal Watercraft (‘Jetski’), Motor Cruising and Shorebased training in the UK – and for certain specialist courses further afield. From our early days we have always been hugely careful about which Instructors we ask to train for us and always ensure that they go through a full induction programme before they work with you. After all whilst we can provide the facilities and the kit for your training course it is the Instructor that you will remember and will inspire you to recommend us to others. We have a core group of Instructors that work for us with the majority having been with us for many years. The group of instructors is supported in the Office by Viv who ensures that everything runs smoothly and that Instructors, Classrooms and Boats are booked and that your course is both fun and straightforward to book. Our core client base are leisure boaters seeking courses like Powerboat Level 2, Intermediate and Advanced Powerboat. We train the full range of RYA theory courses and more recently have added STCW95 courses. We also have a strong client base in the military, commercial, police/fire and rescue and superyacht sectors. 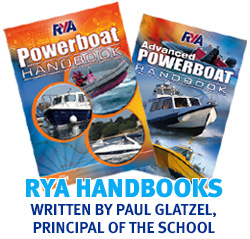 We were delighted when the RYA asked Paul to write the RYA Powerboat Handbook for them. This was a great compliment and lots of fun to do. 2009 saw the publication of the 2nd edition of the book which consistently features in the top 2 or 3 best sellers in the sector. The book is available in five languages and is the top selling RYA publication reflecting the fact that it is viewed as the guide to operating a powerboat. 2014 saw the publication of the RYA Advanced Powerboat Handbook which Paul has also written and is aimed at advanced level leisure users and of course the commercial sector. Paul contributes regularly to a variety of magazines and was one of a few contributors to the book – ‘Heavy Weather Powerboating’ published book by Adlard Coles. We are very much a family run business and our children (not so small anymore) Hannah and Sam play an active part in the school. Both when they turned 16 became Powerboat Instructors and over the Summer of 2016 became Commercially Endorsed Yachtmaster Skippers. Our company mascot is Merlot- he is in-keeping with the water theme as he is a Portuguese Water Dog, and was used to help fishermen in Portugal herd fish! As we have stated our approach is very much to be honest and upfront with people about training. We feel that by doing so – even if it means recommending people to other training providers – that this is the right approach. Like any business we won’t get everything right but we’ll be honest enough to admit our mistakes and work to improve. We always welcome calls, emails and particularly visits to our Office(s). We sincerely hope that we have the chance of providing training to you and look forward to working with you.